SEOUL -- Hyundai Motor Co. and affiliate Kia Motors Corp. aim to increase global sales by 6.1 percent this year by improving quality and investing in research and development. The carmakers are targeting combined sales of 7 million vehicles, Chung Mong-koo, chairman of the companies, said on Monday in a speech to employees in Seoul. Hyundai and Kia sold an estimated 6.6 million units combined last year, exceeding their target of 6.3 million, Chung said. Hyundai and Kia have boosted their global sales as Japanese rivals including Toyota Motor Corp. were hampered by a strong yen and production disruptions after the March quake and record flooding in Thailand. The Seoul-based automakers also benefited from demand for models including Hyundai's Sonata sedan and Kia's Forte compact. "Compared to the last two years, the growth target is conservative," said Park In Woo, an analyst at LIG Investment & Securities Co.
Hyundai is taking this year to control areas that may be overlooked after a rapid growth, such as quality, to avoid the recalls that hurt Toyota, said Park. "The auto industry in 2012 is expected to show slow growth and intense competition between companies," said Chung, who didn't give separate target figures for Hyundai and Kia. 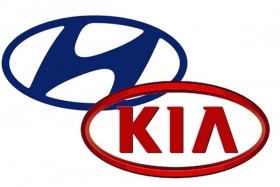 Hyundai and Kia plan to invest 5.1 trillion won in r&d, an 11 percent increase from the previous year, according to a statement in Dec. 29. Hyundai sold 4.05 million vehicles last year, according to a regulatory filing in South Korea on Monday. The company said it boosted overseas sales by 14 percent, selling an estimated 730,000 units in China and 610,000 in India. Kia sold 2.54 million units in 2011, helped by a 24 percent jump in overseas sales from a year earlier, according to a separate filing. The company plans to establish a new China-only brand with its partners in the country to boost sales, spokesman Michael Choo said by phone on Dec. 27.